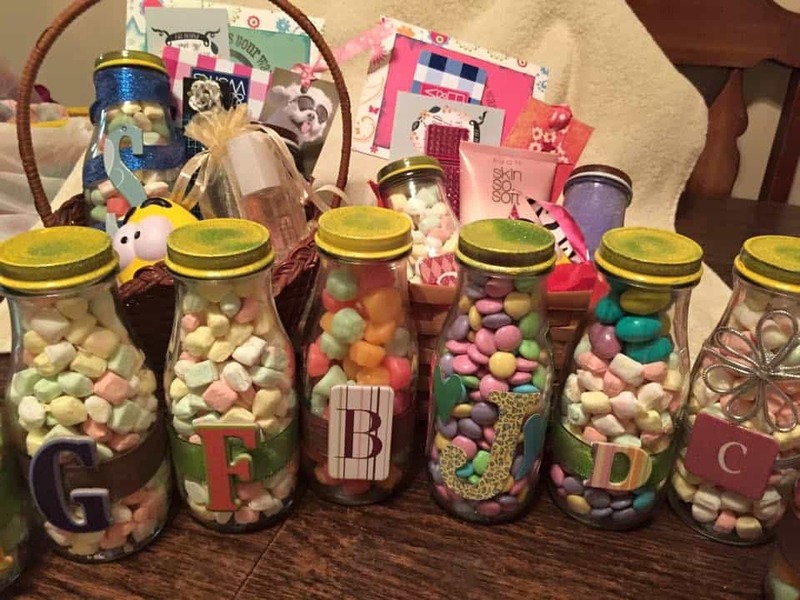 Homemade teacher appreciation gifts can be an affordable and fun way to thank your child’s teacher. And you can give them something useful and personalized to their interests. Because honestly, the last thing your child’s teacher probably needs is another coffee cup. But it can be so difficult to figure out what to give them. I can control the cost. Sometimes, the school has an exceptional Music or PE teacher or Librarian. If this is the case, I like to send them something too so they know their efforts are noticed. It is personalized so it is highly unlikely they will receive this gift from another child. Teacher Appreciation Week is usually in May near the end of the school year. Normally, teachers are beginning the process of off-loading as many school supplies as they can. For this reason, I don’t usually send homemade teacher appreciation gifts in May that contain school supplies. I save random jars from coffee or from spaghetti sauce to use later for gift giving. First I take the labels off the jars (any residue after peeling off comes right off with a drop of lemon essential oil, no soaking required), then decorate them with some ribbon, a cardstock initial on the front, wrap a ribbon around the lid, then add a decoration on the top of the lid. I made felt flowers but you could spray paint the lid or cover it with cardstock. Possibilities here are endless – whatever you could fit in a jar: book lovers supplies, gardening, cooking supplies, Bible journaling, etc – have fun! These homemade teacher appreciation gifts were much simpler. I wanted to gift a lot of teachers this particular year. Using empty Starbucks frappuccino glasses and thoroughly cleaning the labels off, I filled the inside with candy. I spray painted the lids a few days earlier in the garage and let the smell wear off, then I put a ribbon around the middle, and their initial in the center to personalize it. In the back are baskets for the children’s teachers that include a gift card, stress ball, lotion, etc. For the support staff, I sent the candy bottles with a gift card for a free coffee. At the end of the school year, most teachers are ready to pull their hair out. So I like the idea of a relaxing gift. 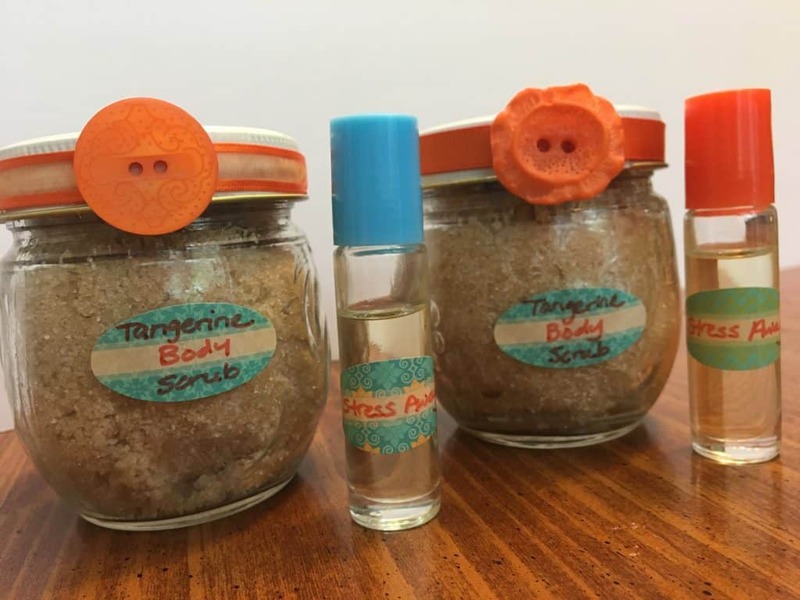 This gift includes homemade body scrub. I found this recipe in the book Essential Oil Make & Takes: Over 60 DIY Projects and Recipes for the Perfect Class . I choose tangerine since it has a nice, uplifting scent. They also received a roll-on bottle of Stress Away essential oil. And I always like to throw in a gift card to Starbucks. Unless I know for sure the teacher doesn’t drink coffee, then I give them a gift card to Sonic or Barnes and Noble. While this isn’t homemade, what teacher doesn’t want a coffee? You usually can’t go wrong with a Starbucks gift card. As you can see from above I usually slip one in any way. This is a fun site to browse 100 super affordable ways to thank a teacher. With summer coming, how about a summer themed basket? Wrap all the pool or beach themed goodies up inside a good quality beach towel: sunscreen, paperback book, plastic cup with a straw, flip-flops, etc. How about a movie-themed basket? Popcorn, movie or gift card for a rental, fun movie candy, slippers, etc. Teacher appreciation week is usually the first week in May. Make sure to show them you appreciate all their hard work this year!